David Fincher’s The Social Network tells the tale of the creation of Facebook through the eyes of the most important players: Mark Zuckerberg, the founder and CEO; Eduardo Saverin, co-founder and Zuckerberg’s best friend; the Winklevoss twins, whose original idea provided the impetus to create Facebook; and Sean Parker, the entrepreneur who helped Zuckerberg take the fledgling idea and turn it into a billion-dollar corporation. Aaron Sorkin’s script looks at the creation of the networking site through the prism of the cynical world we live in. To some, it may seem a simple tale of ambition and betrayal but the thematic resonance of the film is much deeper than that. 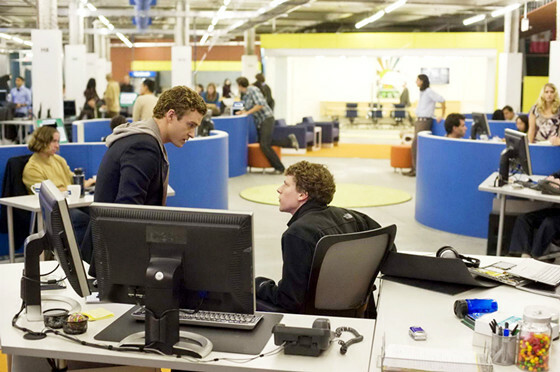 What makes The Social Network a modern masterpiece is how Zuckerberg represents “us” in the modern, social-media, news-all-the-time, no-boundaries-to-sharing age that we live in. It represents what is important to us. It requires the audience to ask themselves if this world and the culture that we have created is what they really want. In making a movie about the creation of Facebook and the contentious relationships involved, Sorkin and Fincher have made a movie about the ‘way we live now.’ In Mark Zuckerberg (the fictional version), they have crafted a character that earns the audience’s bitterness and ire while also reflecting their very needs and desires. That contrast is what makes the movie so sensational. The themes are so brilliantly dichotomous that they demand each viewer examine them closely to fully process them. It’s not that the movie has any sort of didactic agenda, it just perfectly captures so many relevant ideas. Below are ten reasons that The Social Network is the most relevant movie of the 21st century (so far). Zuckerberg originally creates a fledgling version of Facebook after he is dumped by his girlfriend, Erica, played by Rooney Mara. The anger he feels spills into his creation. He gets drunk, blogs spitefully about Erica, and conceives of a website where guys can rate girls from the dorms based on their hotness level. In the moment, Zuckerberg is motivated only by his desire to make Erica hurt. With the courage that he gains from being shrouded by the internet, he mocks her and then takes on her entire gender. It’s an electric moment, but one that also highlights Zuckerberg’s bitter, misanthropic tendencies. The audience is then enthralled with the swiftness in which his site spreads among the college students. It depicts the seductive power of virality. Likewise, however, it reflects on our modern desires to humiliate those that hurt us. With social media such as it is today, the internet has become a bile-spewing playground. Though the web allows incredible amounts of information to be spread quickly, it also invites anger and trash, as the anonymity it spawns intoxicates web users. As Erica finds out what Zuckerberg has written, Rooney Mara reveals the sadness in her eyes. And yet, obviously, the protagonist of the movie is the genius jerk who shamed her. That moment sums up the astuteness of the film. The audience understands well what both characters are feeling and they must look more closely at where their loyalties lie. How do they utilize social media? What are their immediate impulses when they feel like they have been embarrassed in front of many people? Though selfishness has been around since humans have existed, it seems that our world has recently become more about “me,” especially since the advent and subsequent meteoric rise of the internet. Sorkin’s script shows us two specific characters, Zuckerberg and Sean Parker (played by Justin Timberlake) whose selfishness knows no bounds. Parker, especially, is always after more, more, MORE. In one of the film’s most famous lines, he says, “A million dollars isn’t cool. You know what’s cool? A billion dollars.” The Sean Parker of the movie is a man who wants to buck the system, yes. He’s also portrayed as someone whose desires are unbridled. In one of the movie’s closing scenes, as Parker and Zuckerberg unceremoniously boot Eduardo from the Facebook company, Parker is teasing him mercilessly the entire time. 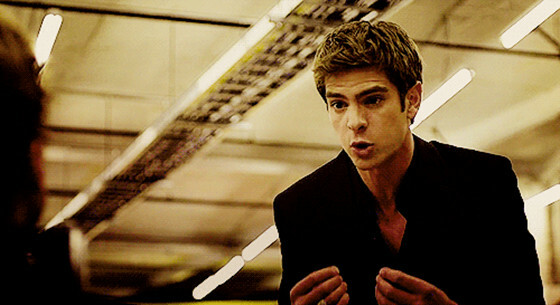 He sits on the sidelines as Zuckerberg and Eduardo have their final showdown and he makes needling, sarcastic comments. He just wants to win. He just wants to conquer. Fincher and Sorkin are asking viewers to examine their own motives as well. 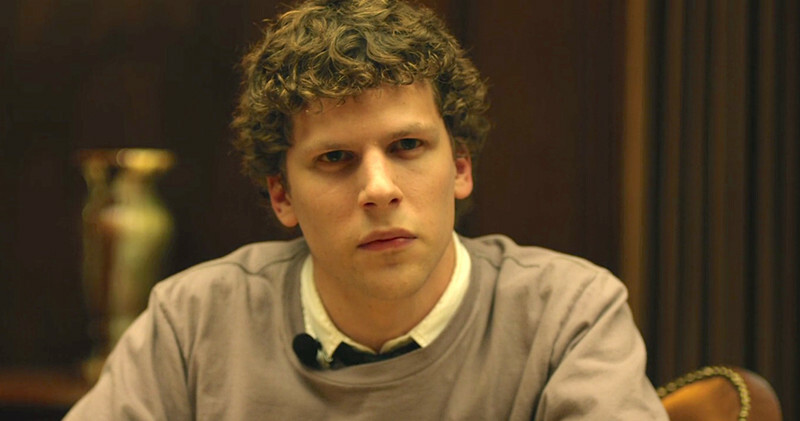 Eisenberg plays Zuckerberg as a man unable to be excited for anyone else’s success. If someone else is prospering, he sees that as an attack on his own success. No matter what the audience feels about the character of Mark Zuckerberg as the movie ends, they know that he was willing to do whatever it took to get what he wanted. That message can be interpreted in a couple different ways. Was the man willing to work for his dream or was he so narcissistic that greed drove him down a dark path? The line between those seeming extremes is much thinner than we realize. There are a lot of people who use the internet for pure purposes. Nonetheless, many more are simply trying to scream the loudest and make a mark on the world, regardless of what that mark is. By introducing the audience to Mark Zuckerberg, Sorkin’s script reminds us of the hidden reasons that people try to get the most likes or “build their social circle.” The world, in 2017, is run on having the most attention. In the movie, Eisenberg’s Zuckerberg becomes the “merry prankster” who gleefully tweaks the establishment. Fincher includes one shot of Zuckerberg being interviewed where he is wearing flip-flops under the table and everyone else is wearing dress shoes. It is a visual reminder that Zuckerberg is not “the man,” but the nerd who fights against the people who make the rules. Thus, getting the most attention becomes a kind of surrogate for sticking it to the man. That theme is further explored through the Winklevoss twins, who represent the jocks of the world. Yes, they are incredibly intelligent Harvard students, but Fincher reminds us often, with scenes of them rowing, that they are athletes and obvious darlings of society. As Zuckerberg misanthropically thumbs his nose at them, taking the seeds of their half-formed ideas and cultivating them into something much better than they could have ever imagined, the audience can’t help but feel a small sense of elation at the takedown of the “gentlemen scholars,” as they call themselves. Thematically, it reminds viewers of the way many approach social media. There, anyone can say whatever they want. There, anyone can fight back against the social norms. There, no one can censor the people! It seems a silly and obvious rallying cry because so often it’s simply an excuse to be a jerk online. People may use these underdog ideas to justify themselves but it usually comes down to a desire to make waves and gain attention. Eduardo gets taken to the cleaners by Zuckerberg. (The Winklevoss twins are also victims.) And though viewers’ sympathies lie with Eduardo, Zuckerberg is the “smart one,” the one that takes advantage. In our world of always-accessible information, everyone has to be much more careful of the ways they interact. Anyone could be on the take. It takes vigilant focus or ultra-secure settings to prevent fraud and misinformation. Sometimes, even those measures are not enough. Eduardo thought he was in the hands of people he trusted. Though he saw the influence of Sean Parker on Mark Zuckerberg, he felt that his friendship, the friendship he continually put time into, even as Zuckerberg wasn’t, would ultimately prevail. Obviously, he was wrong. Though people need to live life and not be controlled by fear, it is nonetheless essential that precautions are taken. Eduardo is by no means a naive man but even he, the brilliant and rich Harvard scholar, is susceptible to being deceived. As more ways are introduced to communicate in bite-size pieces and without being in the same room, people hide behind their computers and their avatars and their screen names. Though Zuckerberg does not hide, his complete misunderstanding of face-to-face communication fuels his Facebook desires. 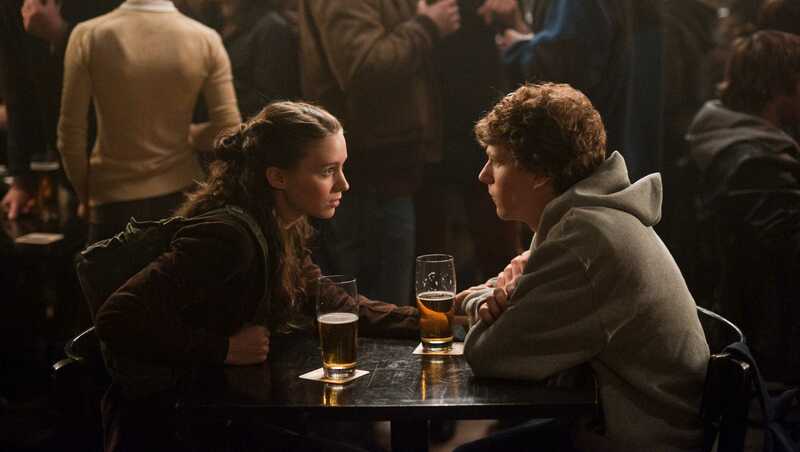 In the opening scene (brilliantly written by Sorkin and masterfully executed by Jesse Eisenberg and Rooney Mara), viewers are introduced, in just five short minutes, to who Zuckerberg is. He is a clueless genius who just wants to have friends. As he tries to have a normal conversation with his girlfriend, it devolves into him insulting her many times, misunderstanding how to make her feel better, and then getting dumped. Of course, this leads to his blogging and the creation of Face Mash and the rest is history. The eventual invention of Facebook furthers his ability to avoid face-to-face interaction. Other aspects of the moviemaking comment symbolically on that degeneration as well. Fincher and his DP Jeff Cronenweth light the entire movie darkly, similar to the visual aesthetic of Seven or The Girl with the Dragon Tattoo. This helps imbue the movie with a sense of impending dread. Combined with Trent Reznor and Atticus Ross’ score, it gives the movie an inescapably tragic mood. This foreshadows the inevitable falling-out between Zuckerberg and Eduardo but it also serves to underscore the tragic direction our conversation skills have headed. As we speak less face to face and lose the skills necessary to interact capably, we turn to the internet. As we become more delirious in partaking in the freedom and anonymity offered by the internet, we eschew in-person conversations. In the film, it affects Zuckerberg’s relationships both minutely and dramatically. In life, it can affect people’s grammar, hygiene, and mental health. The movie is not a specific cautionary tale, but it does offer up its share of cautions. This is one of them.